Tips & ideas to help you organise, declutter & simplify your home, family & life. Last week I posted a Lego Storage: Ultimate Lego organisation ideas article. It was so popular that I decided to do another. 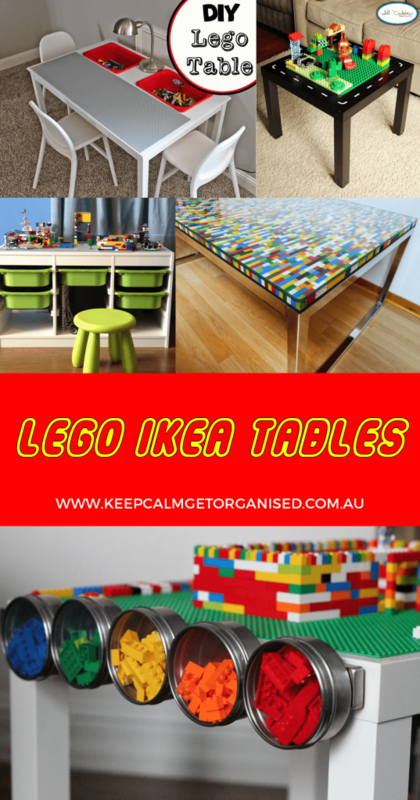 The overwhelming response seemed to be that you were wanting Lego table ideas, specific Ikea Lego table ideas. Well, you’re in luck. 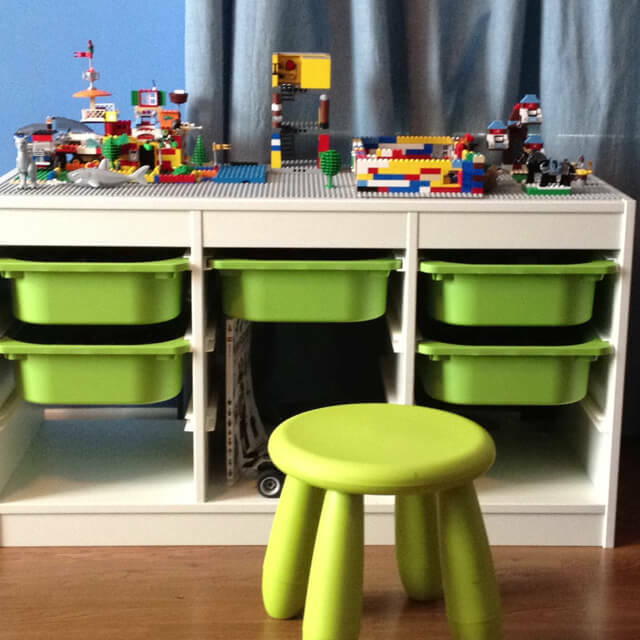 Here are some fabulous Lego tables from Ikea (using a bit of creative hacking) that create fabulous Lego storage. If you don’t want to DIY it I’ve also put together this helpful comparison of some of the best Lego storage tables and you can check out my full post on the best Lego tables with storage here. This has got to be the best Ikea Lego table I’ve seen! It uses an Ikea Ingo dining table and Ikea trofast buckets. So cool and so easy. 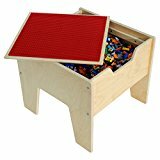 Find me a toddler who wouldn’t think that this Duplo play table using an Ikea Lack table isn’t all kinds of awesome! I think you could whip this up in about 15 minutes and for about $20. Bargain! How cute is this little Ikea Lack side table. It’s even on wheels for portable Lego storage! 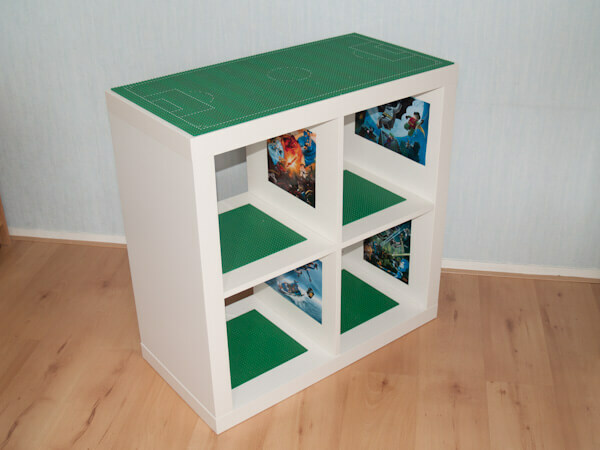 This one is a bigger version using the Ikea Lack coffee table as the ultimate Lego storage table! You’d need a decent amount of space but it has so much Lego storage built in. This is basically a mix between Lego storage, a Lego display unit and a Lego dolls house! The best of everything in one simple Ikea Kallax unit. This Lego table uses an Ikea Lack table with a magnetic strip and tins (found in the kitchen section at Ikea). 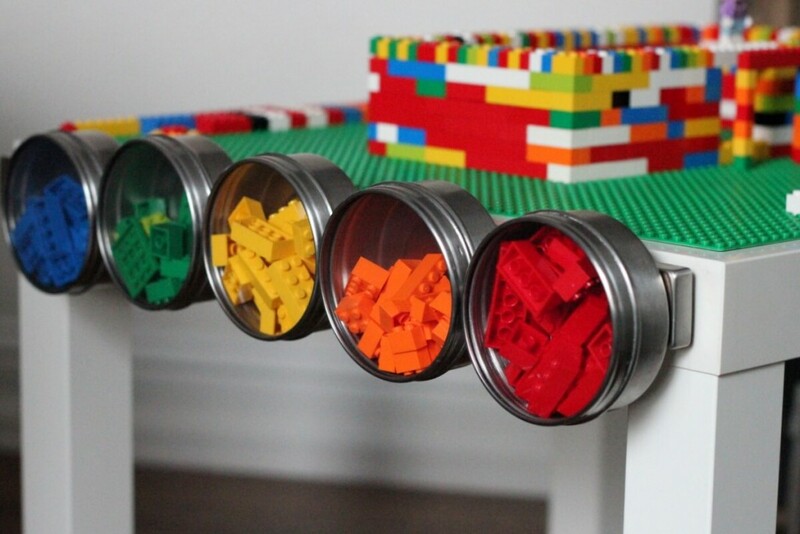 Super clever for easy pull off Lego storage although the little tins probably wouldn’t hold enough. The other side actually has some hanging buckets which you can’t see but would give more storage. 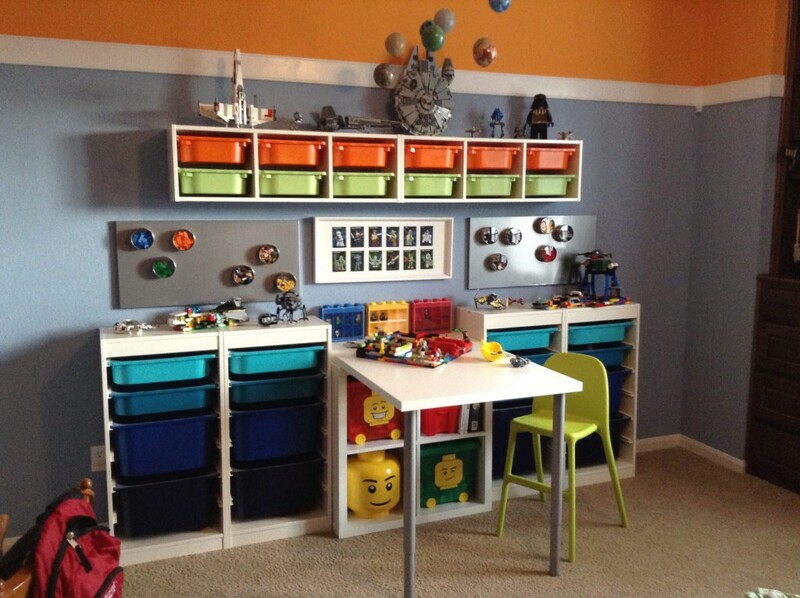 These two Ikea Lego storage units are made with the Ikea Trofast range and are super easy to modify to suit your space. So technically not an Ikea Lego table it is an awesome Lego Ikea hack! How fabulous does it look. I think it is actually Duplo under the glass but you could do the same with Lego pieces… it would just take longer. It’s actually surprisingly easy to make a Lego table. 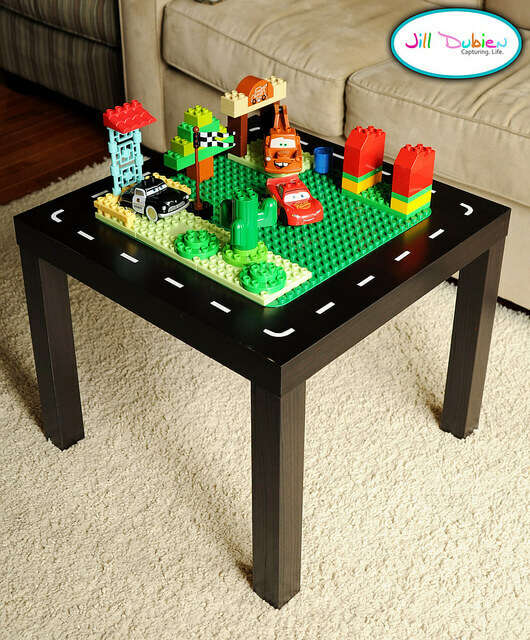 Almost any small side or coffee table can be transformed into a Lego play table for building and creating. 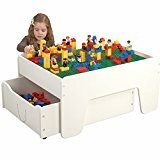 If you choose a larger coffee table then you can use it as a multipurpose play area as both a Lego table and a train table by using a reversible top. I prefer to be able to convert my table back into a “normal” usable table at some point so chose non permanent options. The easiest way I found was to use a piece of plywood exactly the size of the table. Pain one side in a hard wearing lacquer paint. If you want to use it as a train table paint most green with a section or two of blue “water” for some variety. 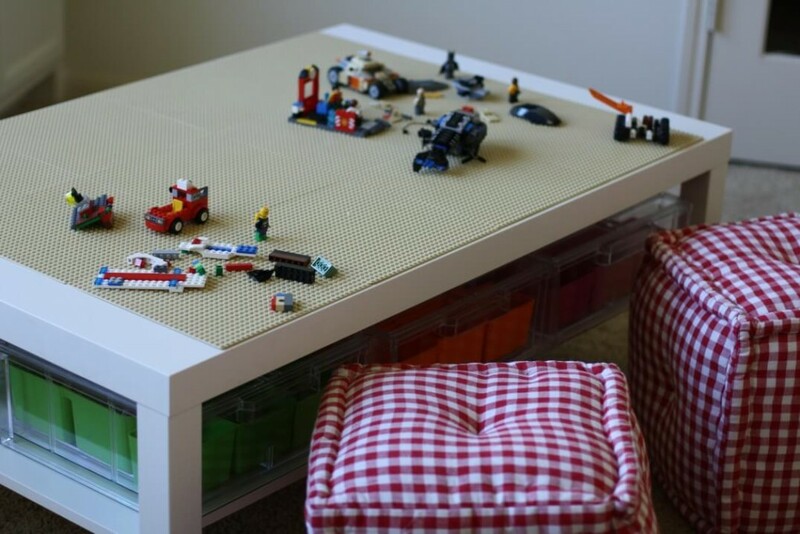 On the other side glue the Lego or Duplo boards on so when that side is up it can be used as a Lego table. To stop the top moving around on the table you can use some rubber stoppers in the corners or place a small angle on each corner of the table to “lock” it into place. 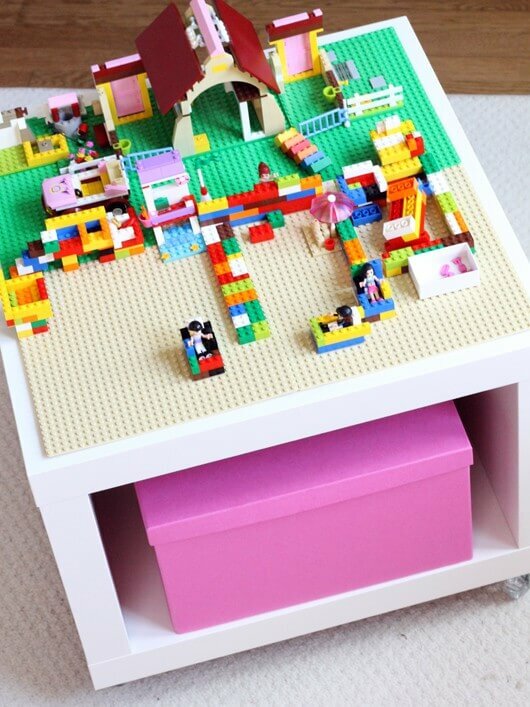 Do you have a Lego table you’ve created from Ikea at home? How did you convert it for the perfect Lego storage and play? We have so much Lego, it’s ridiculous! I’m always looking for new ideas on how to store and display – I love the idea of the mats to go on top of a table. The bits should actually stay in place then, instead of scattering all over the floor! These are very cool ideas! 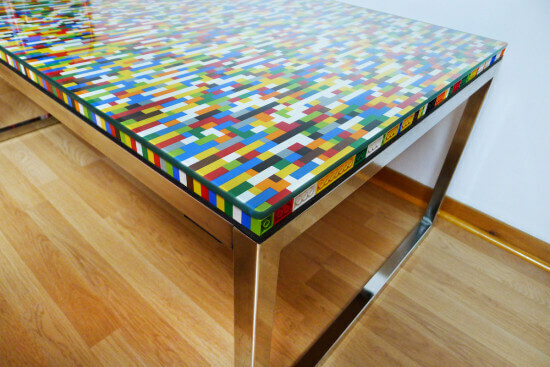 I love the idea of making a lego table. I’m bookmarking this! Wow!! They are so cool! I love all of these.. storage at the site of play = amazing. They are all cool ideas! Hi – i created the lego workstation with the tabletop for my son, Max. It was an experiment with painting the trofast bins – it worked great! There’s more details on my Pinterest page, but feel free to message me if you have any questions! I love these ideas! I would love to know where the desk is from in the 7th picture….the white one with the grey legs with the ikea trofast on both sides. I would like to do this in my sons room. Thanks!! I got the table legs and the table top from IKEA. I cut 6″ off the table top to make it a little shorter (wouldn’t stick out into the room so far) and attached it with a 2″ velcro strip so I’d have more flexibility with it. It works great. Feel free to let me know if you have any more questions – you can message me on Pinterest. Sorry for the delay in reply. I just checked the Ikea website and the exact combination doesn’t seem to be available any more. They do have benchtops that can be cut to size or you could get similar from bunnings. There are also desk tops for the kallax units now available. laws within the state wherever anyone are already existing. 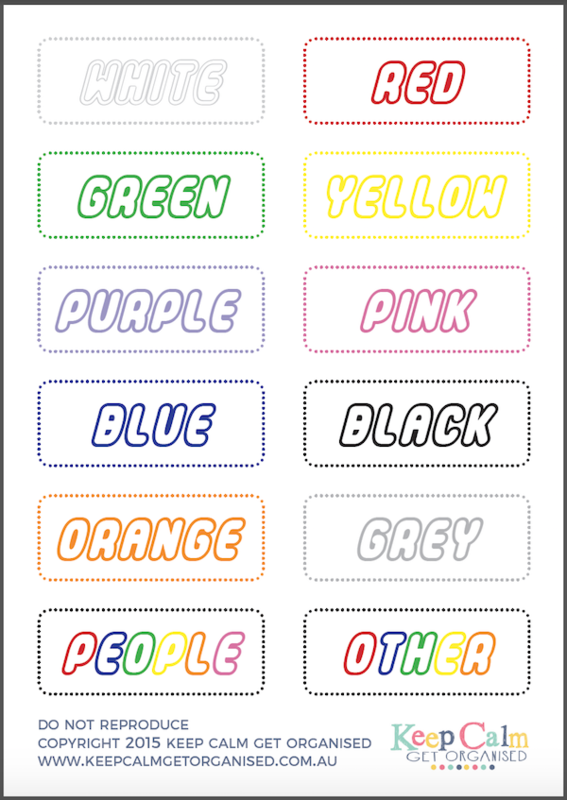 Would you likea set of FREE printable Lego storage labels? Sign up to the newsletter to receive your FREE lego storage labels. The labels come as a PDF and are ready to print as many times as needed. They are perfect for laminating too! Check your email for your confirmation.